Bones and your skeletal system are often misunderstood. They do a lot of heavy lifting to support your body and give it shape. But that’s not all. Your bones do much more to make your body healthy and strong. And they’re more alive than you realize. Learning about your bone anatomy is the first step to properly supporting your bone health. Skeletons can remind us of sickness and death. They often symbolize danger or poison. But your bones are alive and well. And solid bone health starts at the cellular level. Your skeleton is full of cells—each with a specialized job to do. The cells in your bones create everything from new bone to the blood pumping through your heart. But the main focus here will be on the structural components of your bone anatomy. There are three types of cells that help maintain bone integrity. Their names tell us important information about their function. It is important to understand how bone cells operate. Knowing how your bones function can explain how braces straighten teeth and how broken bones heal. The builder cells of the bone (osteo = bone; blast = germ, grow). Their name literally means bone growth. Osteoblasts make new bone and rebuild old or broken bones. These cube-shaped cells stack like building blocks. When osteoblasts come together, they secrete a flexible material called osteoid. Blood vessels and nearby bone cells deposit calcium and other mineral salts in the osteoid to make it hard and strong. After the osteoid hardens, those osteoblasts are stuck and they transform into another type of bone cell—osteocytes. Mature bone cells (osteo = bone, cyte = cell). They come from osteoblasts that have stopped making new bone. Osteocytes grow long branching arms that connect them to neighboring osteocytes. Through these connections they can exchange minerals and communicate through cell-signaling pathways. Osteocytes monitor the bone and detect mechanical stress. They tell osteoblasts when sections of bone need reinforcement. The opposite of osteoblasts. Osteoclasts (osteo = bone, clast = break) break down bone. But this kind of bone breaking isn’t bad. Osteoclasts make room in and on bones for muscles and blood vessels. They also recycle old bone so new, healthy bone can replace it. This keeps bones strong and resistant to mechanical stress. Osteoclasts are large cells outlined with a ruffled border. Their wrinkled exterior grips tightly to bone. These cells secrete hydrochloric acid which strips minerals like calcium and phosphate from the bone. This process is called osteolysis (osteo = bone, lysis = break apart). It’s a team effort between all these cells to maintain your bone health. Osteoblasts and osteoclasts perform opposite roles but work together to make your bones strong. When a bone is broken, osteoclasts remove the broken pieces and smooth any jagged edges. Osteoblasts add new bone to fill in the gaps. It is difficult to see bone cells at work. But your teeth work like bones do, and provide a good example. To straighten crooked teeth, the bones in your jaw are constantly being broken down and repaired. Braces apply pressure to your teeth and jaw. This pressure stimulates osteoclasts to get rid of bone in the wrong place. Then osteoblasts put new bone in the right place. The result is a beautiful smile of straight teeth. You may have heard that without your bones, you’d be a puddle of flesh and blood. And it’s true. The skeleton provides the framework and support your body needs to stay rigid and upright. Bones serve as attachments for muscle groups. They act as levers and allow for muscle flexing and extension. These important muscle attachments help us to walk, run, sit, and stand. Your bones also protect your vital organs from harm. They can absorb the impact of injuries and shield the organs underneath them. Think of all the vital organs your rib cage protects. Your skull is a case for your invaluable brain. And you would be unrecognizable without your bones. While the muscles in your face and neck are responsible for facial expressions, the bones underneath give your face shape. The position of your cheeks, your chin, and nose are all determined by your skeleton. You try to avoid stress, pressure, and tension as much as possible. But these three forces compel your bones to grow and develop. Your bone anatomy makes this possible. Mechanical stimulation triggers osteoblasts and osteoclasts to reinforce the bones in your body. This kind of stress is good, it makes bones stronger. 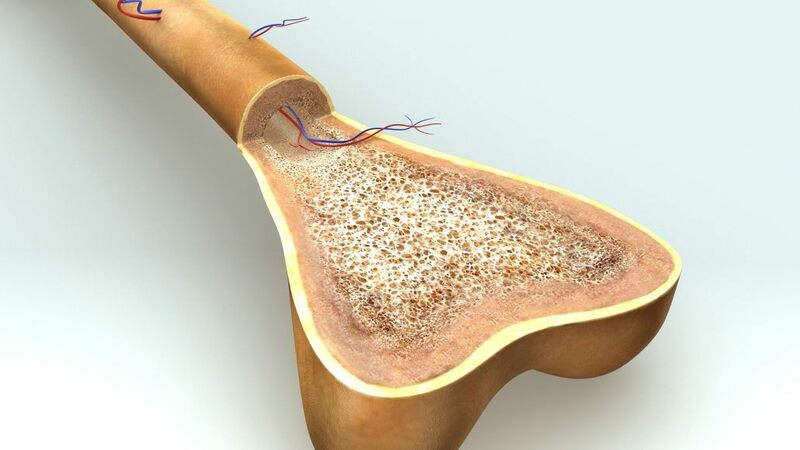 To lengthen, bones need to be pulled on by the muscle groups attached to them. Regions of bone called growth plates are near the ends of the long bones in your body. Growth plates are sections of active bone tissue. When your muscles tug on the ends of long bones, they provide the necessary stress to encourage bone growth. Osteocytes sense the tension in the growth plate and direct osteoblasts to lay down new bone tissue. When this happens too quickly in children, it can lead to a nagging, dull pain. This constant discomfort is often referred to as growing pains. Bones grow in length, but they also increase in thickness. Exercise thickens bones, making them stronger and harder to break. Athletes have often been recognized for having longer than average leg bones. Longer legs, especially thighs, may be seen in athletes because they constantly apply pressure to their bones from frequent exercise. Eventually, our bones stop growing in length when growth plates slow down their activity. For women, this occurs around age 16. For men, it’s about age 19. Between ages 25 and 30, most people will reach their peak bone mass. Maintaining bone mass after age 40 is important and part of a healthy lifestyle. The best way to protect your bones is to fortify them with healthy habits. Diet and exercise are two of the best ways to help maintain your bone health. By far the most valuable mineral to your bones is calcium. When calcium stores are lacking, your body pulls it from your bones to use elsewhere. To safeguard your bones, eat a diet rich in calcium. Bones provide your body with strength and mobility throughout your whole life. Maintaining these important organs will keep your bones working for years to come. Even though bones stop growing in length before age 20, cells are actively repairing and replacing themselves every day. Bone cells regenerate at a pretty remarkable rate. It’s a myth that you only get one skeleton during your lifetime. In fact, your skeleton completely replaces itself every two to 12 years—depending on your age. It turns over more quickly when you are young, and slows as you age. Without this regeneration, bones weakened by prior fracture or constant mechanical stress would never fully mend. Instead these regions grow to be stronger than ever. This constant regeneration and turnover should give you hope. Every day is a new opportunity to help out your skeleton. So it’s never too late to develop habits of diet and exercise that will strengthen and protect your bone health. Learn these 11 bone anatomy facts and share them the next time someone tells you that skeletons are spooky. It will remind them that bones aren’t scary—they’re awesome. Your bones are vascular. This means blood vessels run to your bones and deliver oxygen and nutrients to bone tissue. Nutrients are brought to your bones in the bloodstream. They are necessary for making bones hard and strong. The number of bones in your body actually decreases as you age. Newborn babies have close to 270 bones in their tiny skeletons. As they mature, smaller bones fuse together to form more complex shapes. The human skull is made up of 22 bones that fuse together as we grow. 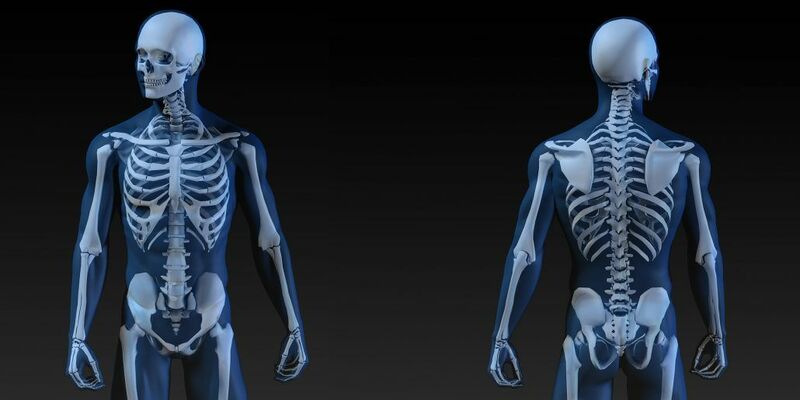 By adulthood, humans have only 206 bones in their bodies. Red blood cells are constantly circulating in the bloodstream. However, their origins are less well known. Bone marrow, the thick substance at the center of bones, produces red blood cells. There are two types of bone marrow—red and yellow. Red bone marrow forms red blood cells, white blood cells, and platelets. Yellow bone marrow can be converted into red bone marrow in the case of severe blood loss. The femur (thigh bone) is the longest and strongest bone in your body. Some experts have hypothesized that the femur is stronger than a piece of steel of the same weight. The shortest bone is the stapes (bone of the middle ear). While still considered part of the skeletal system, teeth are not bones. Bones and teeth have a lot in common. They are both hard, white, and packed with calcium, but there are a few differences that distinguish the two. Teeth do not have the regenerative powers of bone tissue. Teeth are unable to heal themselves when broken. Bones, on the other hand, have a network of cells at their disposal designed to heal cracks and make them stronger. Collagen is a protein found in bones that helps them withstand tension and pressure. Collagen is also an important protein in your skin. It gives skin elasticity and helps your bones absorb shock. Even though they lack collagen, teeth still manage to be stronger than bone. Teeth are the hardest part of the body and are made primarily of a protein called dentine. Dentine is covered completely by hard tooth enamel, and it is this enamel that makes teeth so strong. In the animal kingdom, skeletons are quite rare. Close to 97 percent of all animal life is invertebrate. That means they lack a spinal column. Humans are in the minority. It is our spinal column and the joints attached to it that allow us to walk upright. Of the 206 bones in your body, 106 (more than half) are found in your hands and feet. If you can speak, you owe a lot to a very unique bone. The hyoid bone is responsible for holding your tongue in place. You can feel your hyoid bone by gently pressing near the top of your throat. The hyoid bone is completely surrounded by muscle and the esophagus. This bone is special because it is the only bone in the body not attached to another bone. Bones are considered organs. Taken together they provide no fewer than six essential functions to your body. These include: support, movement, protection, blood-cell production, nutrient storage (mostly iron, calcium, and magnesium), and hormone production. As you can see, bones are much more than stiff, static structural elements. They provide many functions you need to live a healthy life. Start thinking more about bone anatomy and doing everything you can to look after your bone health.